We yearn for the simplicity of previous versions, but it’s still a very useful application. 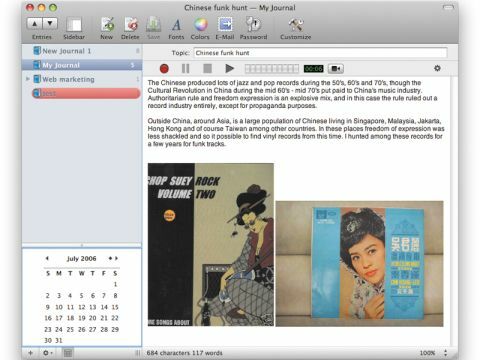 MacJournal is a basic personal diary application that's wonderfully simple to use, reflected in its popularity in the Mac community. Now on version 5, MacJournal has been updated to include more features aimed at interacting with iLife apps, in particular iWeb and Mail. Going into this review, we wondered whether the added features would mean that simplicity had been lost, but more on that later. MacJournal is a basic text editor and filing system. On the left-hand menu panel you have your entry lists. Just click the + symbol to add another, or click directly on the journal entry to expand it into the main panel on the right. You can password-protect the whole app and generally use MacJournal as you would a secure diary. New features also include better media handling for non-text elements. You can now drag in images, PDFs, documents and even movie files into the MacJournal window. Clicking and dragging the bottom left-hand corner of the image lets you resize it. There's also a new audio recording feature, which inserts a recording bar above the main text panel and will record your voice and attach the audio to that journal entry. Cool, eh? Well, yes, but it would be cooler if the quality of the recording was better. We found this feature a bit buggy. Better iLife integration enables you to one-click output entries to Mail or iWeb, although the latter did a rather poor job of interpreting MacJournal's page layout. Is it worth the £10 upgrade? Actually, no. We preferred the older version. The new features might appeal to your needs, but we like things simple and would prefer it if the buggy iWeb and recording features hadn't been introduced. It's nice to use for note taking, but otherwise we don't feel much of a need for it.